Gerald Koppes, M.D. | Cardiology care and testing since 1980. Gerald M. Koppes, M.D. has been in private practice since 1980, except for the last three years with HCA Methodist Physician Practices. He re-entered private practice on June 1, 2013, allowing him to maintain his previous tradition of leadership and service of cardiovascular diseases. Dr. Koppes is board certified in cardiology and subspecialities of interventional cardiology (1999 to 2009), nuclear cardiology, echocardiology, carotid artery and vascular disease. After graduating first in his class at the University of Kansas Medical School, he finished his training at the Wilford Hall Medical Center in San Antonio. 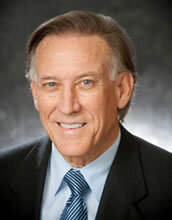 Dr. Koppes has served as the Chief of Cardiology at Baptist Hospitals and on the clinical faculty at UTHSCSA. He has been the president of San Antonio Heart for 10 years. San Antonio Heart, P.L.L.C. has a unique, well-trained, friendly and dedicated staff, offering one-stop care — delivering cardiac and carotid echoes and stress tests at the same appointment for most patients. Not outsourcing to outpatient hospital lab facilities often saves patients thousands of dollars. Dr. Gerald Koppes provides on-site cardiology services at San Antonio Heart including heart and carotid ultrasound, nuclear and stress tests, heart monitoring and pacemaker evaluations. Most major insurance accepted — please call the office to verify. The practice is affiliated with Methodist and Baptist hospitals. Cardiovascular medicine is a subspecialty of Internal Medicine for the diagnosis, treatment, and interventions of diseases of the heart and vascular (blood vessel) systems. Cardiology deals with disorders of the coronary circulation (heart attacks), weak heart muscle (congestive heart failure), heart valves, pericardium (lining of the heart), heart valves, high blood pressure, blood vessels (strokes, leg vascular disease, blood clots), and congenital heart disease. Cardiovascular disease is the leading cause of death. The heart can fail in its muscle (pumping) action, valves (aortic, mitral, tricuspid), blood vessel occlusion with cholesterol & clots (Coronary artery disease), and electricity (pacemakers), syncope/fainting, arrhythmias (irregular heart beats). Cardiologists use a variety of tools to diagnose and treat cardiac and vascular disease. Coronary interventions to treat stenotic (blocked) arteries with stents and balloons (PTCA) angioplasty. Opening clotted coronary arteries in acute heart attacks. Pacemakers, EKGs, monitors for syncope. ECHOCARDIOGRAPHY (Echo) - Sonography to visualize the heart, valves, blood vessels and flow. NUCLEAR CARDIOLOGY - Stress tests (Treadmill and Chemical) to test the coronary arteries and chest pain. San Antonio Heart, P.L.L.C. ©2016 Gerald M. Koppes, M.D.